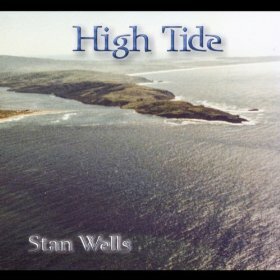 Not many musicians can attract artists such as David LaFlamme, Nina Gerber, Betty Perkins, and Ramblin’ Jack Elliott to appear on the debut album but so it is with Stan Wells and his release High Tide. Stan Wells has been writing songs his entire life and now has decided to record 15 of them. He can be classified as a singer/songwriter who presents his material as a modern folk artist. While his music and lyrics have a simplicity, he fills in the sound with a number of different instruments which gives it layers of textures. He has a very laid back approach. Incisive lyrics and subtle melodies add up to a relaxed listen. My only criticism is the tracks have a sameness of tempo and style when taken together but each track in and of itself is excellent. The album begins on a high note with the title track. His duet with Betty Perkins on the chorus sets up his gospel-influenced lead vocal. It is a song that allows your mind to drift away as he spins his tale. David LaFlamme’s musical journey goes back to the 1960’s when he played with the likes of Jerry Garcia and Janis Joplin before he formed the innovative west coast band, It’s A Beautiful Day, a version of which he still leads. A classically trained violinist, he brings his unique sound to three of the tracks; two of which are highlights. He gives a poignant performance on “Fantasy Junction,” which is a tale of lost love. “Sit Beside Me” features only LaFlamme’s viola and Wells’ 12-string guitar. The way they play off each other gives the song a unique beauty. Folk legend Ramblin’ jack Elliott brings his 50+ years of experience to “Here We Go Again” where he shares vocal and guitar duties. The production is excellent and the enclosed booklet contains the lyrics of the songs, which is always appreciated with a musician such as Wells. High Tide was 35 years in the making and contains a collection of excellent material. Hopefully it will not take Stan Wells 35 years to issue a follow-up.